What they don’t tell you: Times are changing. Quickly. It’s no longer good enough to just care for your patients. It’s time to create a medical marketing plan. 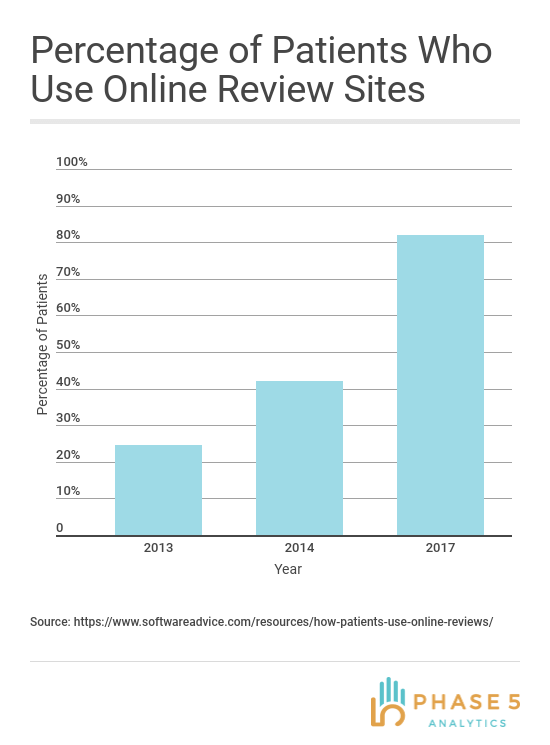 Softwareadvice recently conducted a survey to US patients and found that 82% of patients consult websites like Yelp, Healthgrades, and RateMDs to view or post ratings of healthcare staff. And the numbers are increasing dramatically year over year. Online presence is becoming the leading factor in a patient’s decision on which doctor to see. Especially since 8 out of 10 of people trust online reviews just as much as recommendations. Rather than relying on their friends or family for a recommendation, potential patients are turning to their most trusted wingman: the internet. This is an extremely in depth guide to medical marketing, so feel free to jump ahead. Medical marketing is any effort to reach potential patients. There are 5 major parts that make up a successful medical marketing campaign online. We’re going to walk you through all of them. Medical marketing starts with Search Engine Optimization: the practice of tweaking your website so you’ll show up in online search results. SEO is broken up into 2 main parts, On-Page SEO and Off-Page SEO. We’ll talk about both of them. Next in line is Pay-Per-Click Advertising (PPC): a vastly underutilized tool in the medical marketing industry. We’re strong believers that almost every doctor, private practice, and hospital should take advantage of PPC advertising. We’ll then move onto Online Reputation Management: the process of optimizing your online image across social media. We’ll walk you through the ethical ways to get genuine 5 star reviews on Yelp, Google My Business, and Facebook. Finally, we’ll talk about a few ways to ensure that you’re always remaining HIPAA Compliant when engaging in medical marketing. There will always be a demand for the medical services that you provide, but patients need to be able to actually find you. Note how he is pretty vague in where SEO is implemented. This is because SEO tactics could and should be used on both your own website and others, known as On-Page SEO and Off-Page SEO. For medical practices, optimizing your website for local search traffic is the best thing you can do to find potential patients in your area. 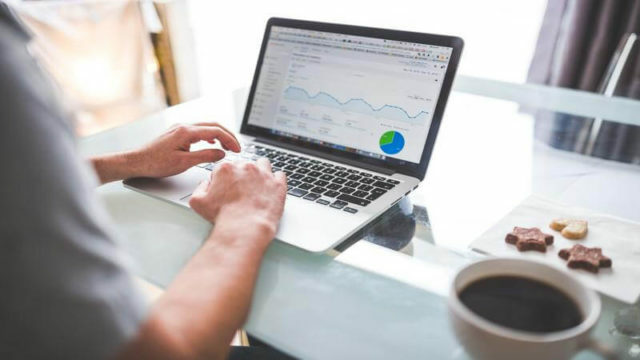 In this blog, we will address how to begin with both on and off-page SEO as well as introduce you to two of the most effective strategies, backlinking and content marketing. These top three listings get over 60% of the clicks; entirely for free. 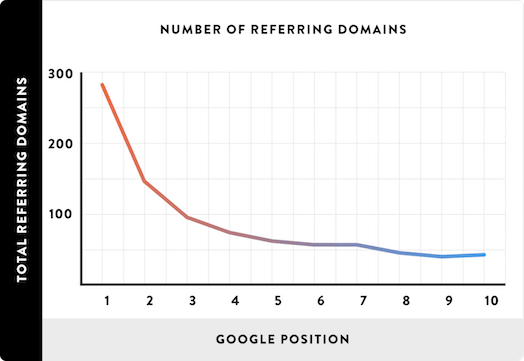 Here’s a study done by Chitika that shows the percentage of clicks associated with each spot on the Search Engine Results Page. 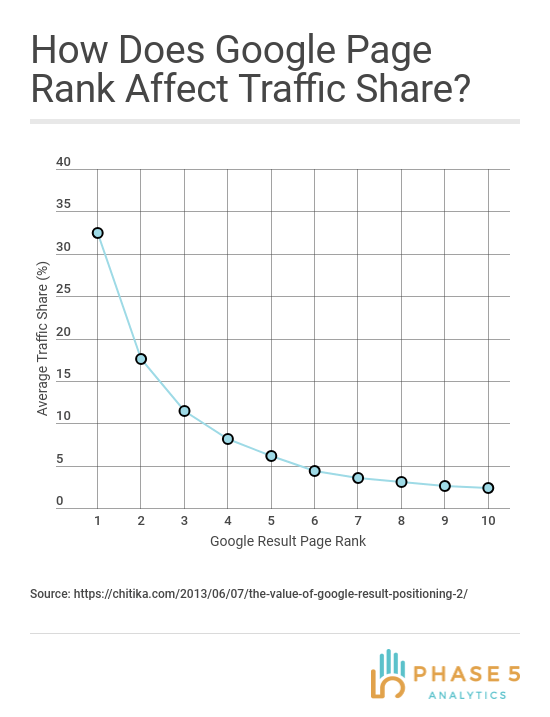 The drop off is significant; if your practice is the 6th result on Google, you’re only getting 4.4% of the traffic. So how do you use SEO to get higher up on the results page? Well, there are many moving pieces, but the first thing you should do is identify your practice’s keywords. Keywords tell Google when to show your website in search results. Once you’ve identified a few target keywords for your medical practice, it’s time to begin implementing some changes to your website. This first step is what we call on-page SEO. In its simplest form, On-Page SEO is the practice of changing your website to help you move up in organic search rankings. In a more nuanced form, SEO is a way of communicating with Google to prove that your site is relevant for the user. Google wants to provide the best answers for its users and SEO is a way of convincing Google that you are what the patient is looking for. But you have to be able to speak Google’s language. You can do this through Title Tags and Meta Descriptions. Title Tags are the headlines of your webpages. They’re what shows up most prominently in search results. And they’re a huge factor in how Google ranks your website. The Meta Description is the portion of text under the title tag and URL. Meta Descriptions don’t directly affect search engine rankings. But they’re important for getting potential patients to click on your website. The percentage of people that click on your listing after seeing it is called the Click Through Rate (CTR). The higher your CTR, the more likely patients are to go to your website. 1. Begin with your keywords. The beginning is the best place to start. So start your title tags with what you know your client base is looking for (a.k.a. your keywords). Take this blog post for example. It begins with the words “Medical Marketing”, which is our focus keyword. We’re looking to attract readers that search for that keyword. Putting it first in our title tag tells Google that “Medical Marketing” is the focus of this blog post. 2. Make your title tags between 50-60 characters long. If it’s too short, you’re leaving out a ton of valuable real estate on the search engine results page. Nobody wants to struggle when reading a listing. Keep it grammatically correct, take out any numbers and create a clear and concise message. As you can see, the first title tag isn’t optimized. It’s doesn’t feature any keywords. It only contains names, which adds no SEO benefit. However, the second title tag is great. It contains the name of the practice. It’s 55 characters long, which is perfect. Just like the title tags, you should put some thought into your meta descriptions. These are the little blurbs underneath the header on the results page (or, as you now know them, title tags). Meta descriptions grant you the opportunity to expand more on the content of the landing page and you want to be able to use that opportunity to your best advantage. 1. Fit your other keywords in there tastefully. The goal is to add relevance and engage the viewer. 2. Make the sentences flow naturally; you want your meta descriptions to be easy to read. How would you like it if you were looking for a plumber and saw a meta description like this? This meta description is choppy, irrelevant, and the capital letters make it seem like spam. 3. Keep your meta descriptions just under 300 characters because Google tends to cut them off at around that number. The goal of title tags and meta descriptions is also to convince people to click on your link. Most of the grunt work for SEO needs to be done on your website. The best thing you can do is create unique pages for each service you provide and each location you serve. 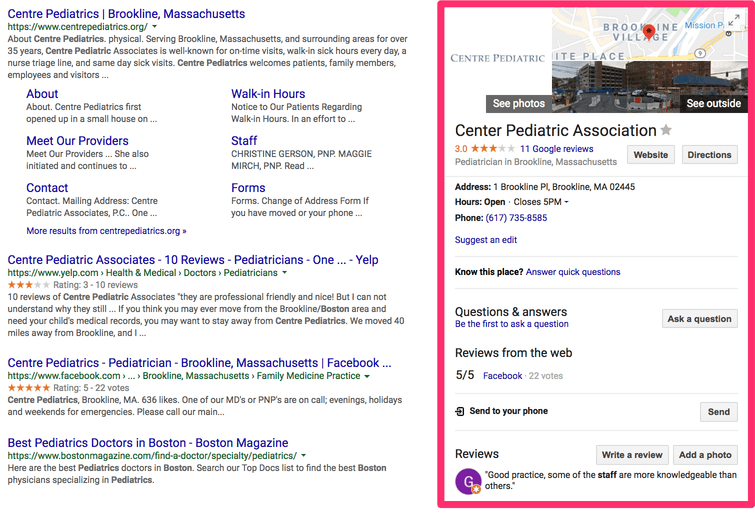 If your medical practice serves more than one location, it is incredibly important to create unique pages for each location on your website. Why? Because your location is one of your most important keywords, even if you have multiple. When people put into the search bar “best dentist in New Haven,” you want to be able to pop up with your landing page specific to your New Haven location. If you have a second location in Madison, you want to pop up when people search for “best dentist in Madison” as well. Note: It’s very important to avoid copy and pasting content from other pages. Each page MUST have unique content to remain favorable in the eyes of the search engines. Another key tactic in SEO is to optimize your URL structure. Small changes to the URL structure can make a difference in the way that users assess your relevance and trustworthiness. In fact, it’s one of the most important factors in a user’s decision when they’re deciding whether or not to click on your link. Use keywords – but don’t stuff them. Don’t include words like: and, or, but, of, the, a, etc. Off-Page SEO is a series of practices for SEO which take place on third party sites, rather than your own website. If other sites mention you, or dedicate a profile to your practice, you want to make sure that you are portrayed accurately. This goes hand-in-hand with reputation management, but the focus here is to maintain a consistent image online. Basically, if you show Google that you take your online presence seriously, Google will reward that by featuring you higher up on the results page. 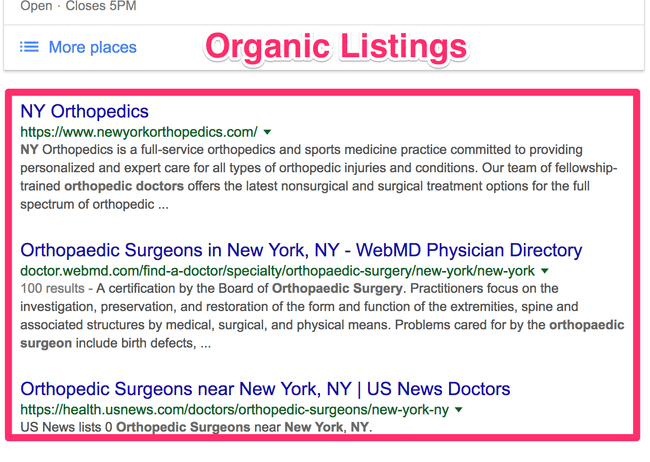 This is a great place to start because review sites often show up very high in the organic listings. You need to claim your profile wherever your practice or individual doctors are listed – Facebook, Yelp, Google My Business, Healthgrades, etc. If your practice is not on any of these social media sites yet, get listed. If you’re not there, you’re missing out on free traffic to your practice. 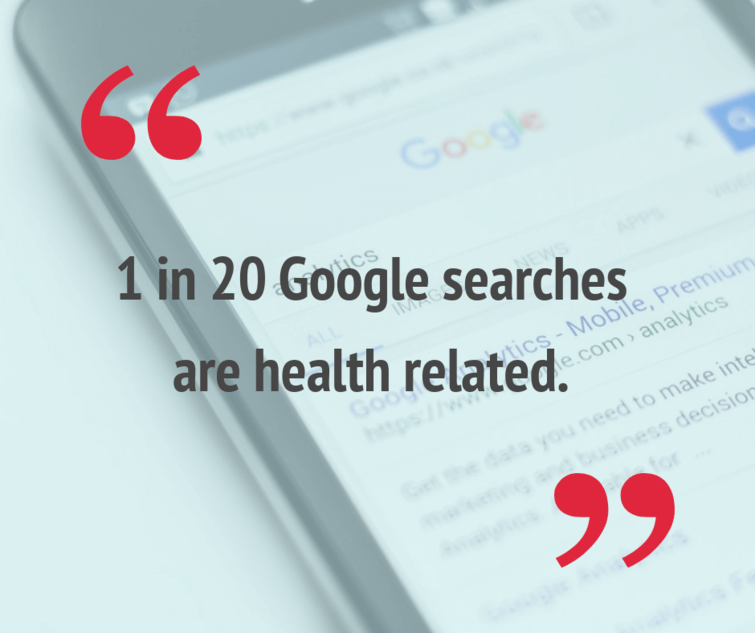 The more information Google and the other search engines have about your practice and doctors, the higher you will be ranked. Make sure that your Business Name, Address, and Phone Number are exactly the same on all sites. This is important for SEO because inconsistent NAPs will hurt your ranking in search engines as well as your legitimacy. Although technically this is a part of off-page SEO, We’re dedicating a complete section to it because of its importance. Links to your website from 3rd party sites (known as backlinks) have a massive impact on your search ranking. You should be actively trying to create links to your practice’s website from other websites because of its importance to Google. While a few hundred links may seem like an unrealistic goal, you won’t need that many to rank well in local markets. You can spend months pushing out high quality content and waiting for those SEO changes to kick in. Your best bet for quick, highly measured traffic is pay-per-click advertising with Google AdWords. In a nutshell, PPC is a way of faking your way to the top of the search engine results page without waiting the necessary time to get there by Search Engine Optimization. This system allows advertisers to place a maximum bid for ad placement on the search engine results page. And as the name suggests, in pay-per-click advertising you only pay when someone clicks on your ad. Improving the quality and relevance of your ads can help drive costs down, and set you up for a massive ROI. Google cares a lot about relevance. And a lot of that hinges on your keywords. Queries: what someone types into the search bar. Keywords: the word or phrase you’d like to show your ads for. Click Through Rate (CTR): the percentage of people who click on your ad after seeing the ad. If keywords are the bread and butter to my success online, how do I make sure I’m taking advantage of the right words and phrases? The answer, love it or hate it, is research. Through keyword research, you’ll be able to predict how potential patients are searching for your services online. Keep in mind that sometimes the most important part of a successful marketing campaign revolves around what is absent, rather than present. Negative keywords are arguably the most important part of narrowing down your exposure to get the highest quality clicks you can. You only want your ads to show up for people who are looking for your services. Generally, negative keyword lists should be as detailed as you can possibly get them and again, as you continue moving forward, you may encounter more negative keywords to add. Many people use Google as a diagnostic tool; you do NOT want your ad popping up for someone wondering why their stomach is hurting. You want to be using AdWords to attract new patients. That user is not at the stage of becoming a patient and is looking for answers rather than opportunities for care. That being said, you know your practice best and what kind of service you are providing and what kind of patient you are trying to attract. In order to create a good ad, much like with your keyword research, you need to be able to get inside the head of those who are searching for the services you provide. How do you convince potential patients that you are qualified and can address all their needs? The short answer to this question is to take up space. Our habits online are pretty lazy and so we are more likely to click on the first thing we see. This could be a first-place spot on the google results page, but it is also likely to be the biggest ad on the page. Ads with more components break up the page and draw in the eyes of the user. The best way to get this “real estate” on the results page is through ad extensions that show your different landing pages under your main site. These features offer the user more options and easier access to the information they are looking for as well as increase your quality score in the eyes of Google. Note that in this example, the advertiser in the first ad has utilized several different ad extensions as well as enhanced their title and description to take up as much space as possible with relevant material and plenty of keywords. A persuasive call to action, list of services provided, location, and three direct links into the website are all provided before we have even entered the site. In contrast, the ad underneath it lacks significant information about the practice as a whole and does not give the sense that it will address the concerns of the user. A $750,000 lawsuit was filed against a Virginia woman for a Yelp review she wrote about a construction company. And that’s not the only case. Everyday, people are fighting over false or exaggerated reviews on Yelp and other similar websites. Nobody likes to see bad reviews of themselves, especially when they’re not true. Most of the time, doctors just choose to ignore them, but you shouldn’t. Reviews are extremely important to patients. So what is reputation management? How do I get rid of bad reviews? Reputation Management is the practice of actively monitoring, responding to, and shaping your online image. But in order to understand reputation management fully, we need to take a look at each part that goes into it. For doctors and medical practices, we tend to focus on these 4 major review sites. Each of them caters to specific audiences, so it’s important to take each into consideration when creating a medical marketing plan. Most people believe Yelp is the biggest source of patient referrals in the healthcare industry. Yes, Yelp is HUGE for medical marketing. But Google My Business is even bigger when it comes to medical marketing. Potential patients are searching for medical related terms on Google in record numbers. Way more than the amount of searches on Yelp. Let’s break down what Google My Business is exactly. 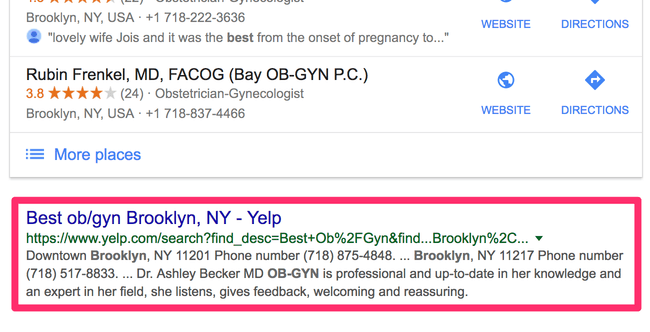 What I’ve highlighted in red is the Google My Business profile of this particular OB/GYN practice. Google recently announced an update that affects local Google My Business listings. It has been dubbed The Google 3-Pack. 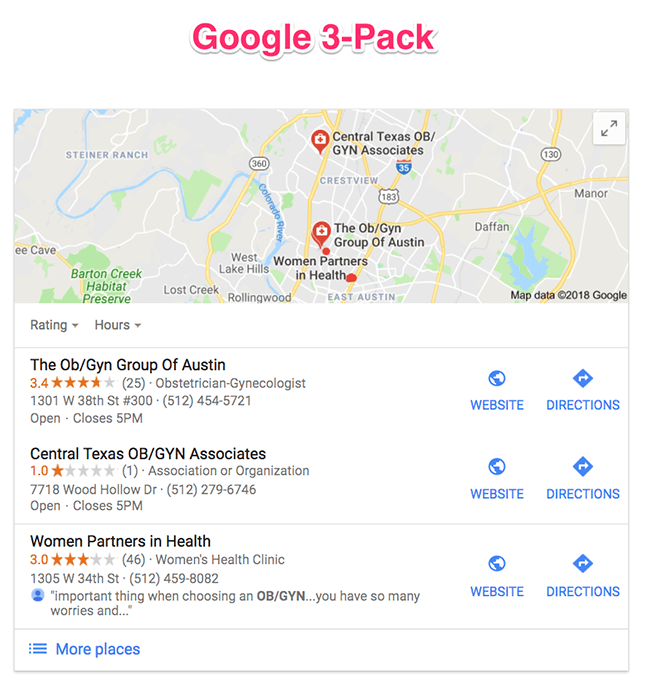 When users search for local businesses, like “austin texas obgyn”, they’re met with 3 local listings. This is the 3-Pack, and it’s the first thing to show up. Bottom line, you want to get your business listed here. The best way to do this, is to optimize your page. People seem to neglect Facebook in terms of medical marketing. Those people couldn’t be more wrong. 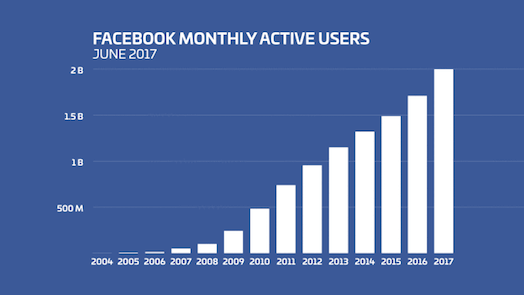 Just take a look at the amount of monthly active users that Facebook is reeling in. The amount of users increases by ~ 14% year over year. That’s 2 Billion users who come back each month. Over 1 Billion users come back every day to the social network. You’ll cultivate a group of your biggest fans. This is extremely valuable to savvy medical marketers like you. When you’re trying to get people to review your medical practice online, you only want to be asking your biggest fans. Nobody who has had a bad experience with your practice is going to follow you on Facebook. Now, you’ll have a group of people who love your practice at your fingertips. Yelp began when one of it’s founders, Jeremy Stoppelman, got the flu. Stoppelman began looking for referrals online to find a local doctor, but came up empty handed. Since 2014, Yelp has quickly climbed to become a key player for online referrals, especially for the healthcare industry. Today, of Yelps 142 million monthly visitors, 79% are researching or reviewing health or medical businesses. Any successful medical marketing plan must involve Yelp. That being said, Yelp is a stickler when it comes to asking for reviews. In order to avoid being penalized by Yelp, it’s important to pay attention to their guidelines and make sure you’re not breaking any rules. Healthgrades is another huge name in online reviews for doctors, amassing over 12 million visitors during its 10 year tenure. It is a trusted source, and over all the other review sites listed above, Healthgrades focuses specifically on medical practices and professionals. This makes it easier for the searcher to compare your profile against others, which can be a positive. For doctors and medical practices, it’s important to practice HIPAA Compliant Marketing. Since many email addresses contain enough information to identify the owner, they’re considered PII (Personally Identifiable Information). For example, andrew.epprecht@phase5analytics.com would obviously belong to someone named Andrew Epprecht. The first step to HIPAA compliant medical marketing is choosing a HIPAA compliant email service. It’s important to note that none of these email services are HIPAA compliant without a bit of alteration. Our favorite, and the email service that we recommend to our clients is G Suite – Gmail’s paid counterpart. Gsuite only costs $5/month, and Google will sign a BAA (Business Associates Agreement) for you. 1. Setup G Suite. All you have to do is click here and follow the steps. 2. Get Google to sign a BAA, click here and follow the steps. If you need help following these steps, reach out to us and we’ll help you through the process. 3. Install end-to-end encryption. We use Paubox. They’re easy to set up, and we use them ourselves. Medical Marketing is the best thing you can be doing to grow your practice right now and PPC is the best place to be putting your money. You can track exactly where your money is going, how well it is working, and where it is most effective. You are investing in yourself! Even if all you do for your office(s) is claim your pages and update your information, you will greatly improve your SEO and reputation in the eyes of potential patients. It is always up to you how much work you want to put in here, but it is an ever-evolving process and there is always room for improvement. Online medical marketing involves constant attention to detail and eternal optimization, but isn’t that exciting? While your practice is as amazing as ever, a few tweaks in the wording of your ads can bring in a whole new influx of patients. If you choose to invest your time and effort into your medical marketing project, you will not be disappointed and you will be amazed at the numbers you see.